Emily and Spencer hired me a few months ago to photograph their engagement session, with Spencer's new military career they decided to elope locally and have a small ceremony. 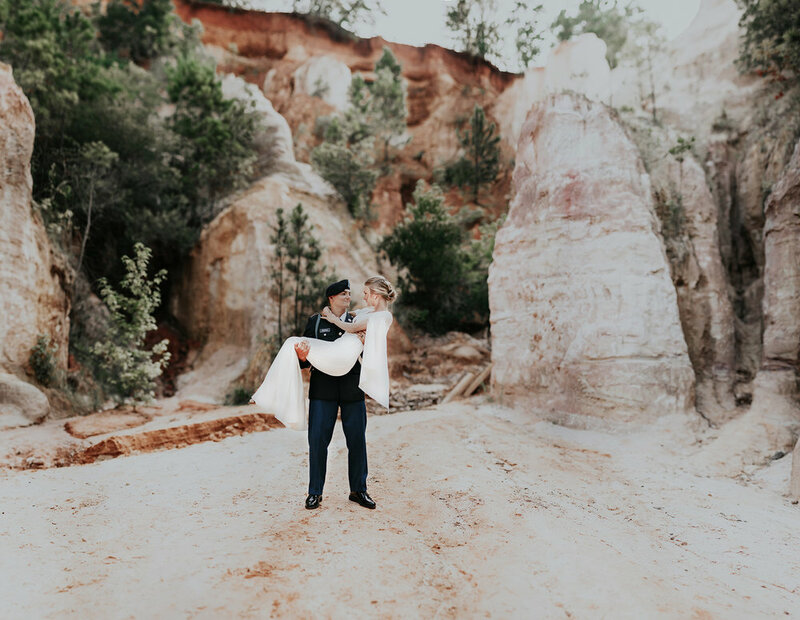 After seeing some of my latest work, Emily wanted to re-create their elopement at Providence Canyon State Park about an hour away in Cusseta, Georgia. The canyon itself is fairly small but has miles of hiking trails and is perfect for couples, families or in our case wedding photography! The trail down and back out can be a little mucky, and fairly steep for those of us that don't get in a lot of cardio (hello, me). We decided on a sunrise session to beat the heat and the crowds, and arrived with the first glimpse of the sun and our crummy shoes in tow. These two truly are just as adorable in real life and I wish them the best of luck with their new married & Army life! want to book an elopement or wedding?